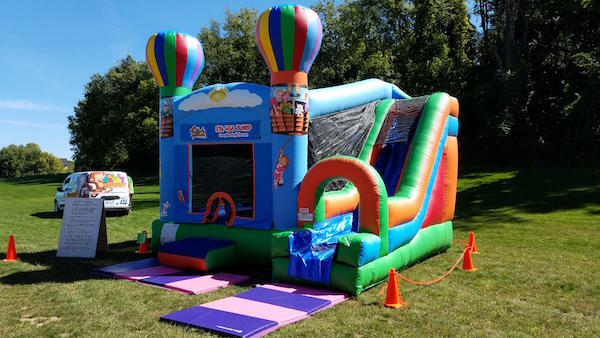 When you are renting a bounce house or slide from a reputable party rental company you should receive a commercially manufactured inflatable that has been inspected, registered and insured. The commercial manufactures have a responsibility to make inflatables that are durable, safe and meet ASTM standards. These commercial bouncers can cost from a few thousand dollars up to 50,000 dollars or even more depending on the size of the jumper. When a commercially made inflatable is properly installed by a professional they are in fact very safe. The manufacture and the ASTM standards require a minimum 5/8’’ x 18’’ hook steele stake driven completely into the ground. Larger bouncers will require 24’’, 36’’ or even larger stakes depending on the size of the inflatable. All commercial inflatables have a wind speed max printed on the jumper with the safety rules usually between 15 and 20 mph. If the wind exceeds that then the operator should immediately evacuate the patrons and shut down the inflatable ride. A bounce house bought from a big box store will be priced at a few hundred dollars and usually come with 4" plastic stakes and made of a much lighter weight vinyl and stitching. The average homeowner has no formal training and will have no idea of the danger of these store bought inflatables. All PA amusement rides require a trained adult operator present at all times. In most cases the homeowner will set up the inflatable, pound their plastic stakes in then walk away hoping the kids will have fun. Here in Pennsylvania we have very strict laws and regulations on amusement rides we have to take classes and pass a state mandated test to become an amusement ride inspector before we can even own an inflatable ride and then every time it is rented out we are required to do a physical inspection report and register the event with the dept. of agriculture. The moral of the story is beware of store bought bounce houses that you paid a few hundred dollars for thinking it’s a cheap way for the kids to have fun. Here is a proper set up outdoors all anchor points are staked down. There is a visible barricade around the unit. We have crash pads at entrance and exit of the inflatable and a sign posting the safety rules next to the entrance. Our inspection report and owners manual are onsite. You must also post the rider “Responsibility Requirements” at the entrance of the ride. All of these things and more go into a proper and safe set up. Interested in renting an inflatable for your next party or event? Check out the links below to our awesome selection!